Making candles is one of my favorite crafty hobbies. 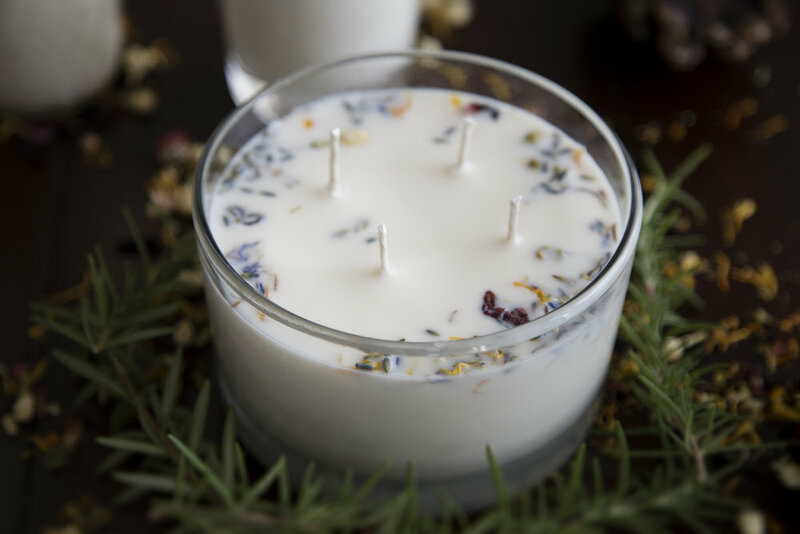 It's a great creative outlet, and after tons of experimenting, I crafted my own recipe for making the perfect homemade candles. I burn these candles regularly in my house, use them for decoration, and also give them as gifts. They make thoughtful and affordable gifts, especially around the holidays! 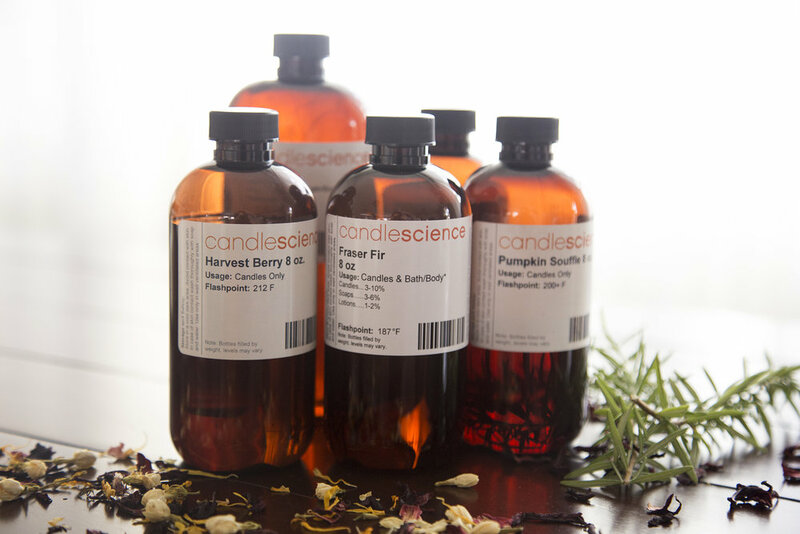 Candlescience.com is a hub for all things candle-making, and they have a large collection of fragrance oils perfect for holiday gifts. A few of my favorites are Pumpkin Souffle and Fraser Fir. 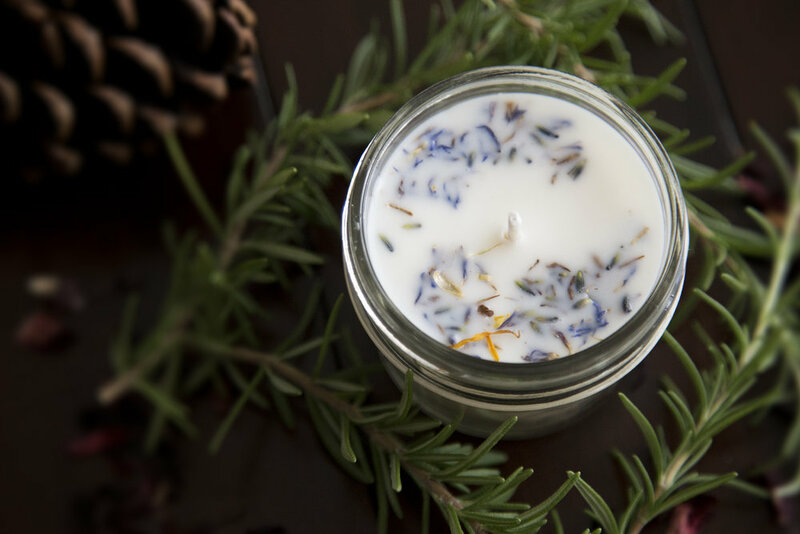 I first got into candle making because I used to burn so many store-bought candles, I thought I could save money (and have fun) by making my own. It's a little pricey at first when you purchase all of the supplies, but after a few batches, it's worth the initial investment. I recycle my jars after I use a candle so once you have all of the tools and materials, the only thing you'll need to replenish regularly is your wax. Fill your wax pitcher with wax chips and heat up on the stove top on medium heat. The wax will shrink as the chips melt, so keep adding more chips until your pitcher is 2/3 full of melted wax. Be careful not to burn or scorch the wax, or overfill the pitcher. Place your thermometer in the pitcher, and heat the wax until it reaches 185 degrees. If your wax is hotter than 185, pull off the stovetop and cool until it reaches 185 degrees, which is when you'll add your fragrance oil. Measure out how much oil you'll need based on the amount of wax you've melted. Pour your fragrance oil into the pitcher and stir. Fragrance oil to wax ratio: Add 2 tbsp of fragrance oil per 1 lb. of wax. This is also the time that you can add dye to make colored candles. (You can purchased dye here.) Colors can be mixed to make specific shades. Keep in mind that when you add coloring to your wax, it will look more saturated in the melted wax than the finished candle will. To test what color your finished candle will be, take a small amount of wax from your pitcher and place onto a paper plate or parchment paper, and allow it to cool. The shade of this sample will be the color of your finished candle. If you want more saturated color, add more dye. After you add your scent and/or dye, the wax will need to cool to 125 degrees before you can pour into your containers. Set the wax aside and allow to cool. Cooling usually takes about an hour at room temperature. I would not recommend speeding up the cooling of your wax by placing it in the refrigerator or outside, because if the wax cools too quickly, the tops of your candles will not be smooth and craters will form. While your wax is cooling, prep your containers. Make sure you are using clean, dry glass, or ceramic containers. Never use plastic. To prep your containers, place wick stickers on the bottom of your pre-tabbed wick, and stick to the bottom of your container. Make sure the wick is centered in the container, and press firmly to make sure it's stuck. If you're using a wide or large container, you may need to place multiple wicks in the candle to make sure it burns evenly. After your wick is in place, use a wick centering device to keep the wick in place. You can purchase pre-made wick centering devices, or make your own with thin wooden sticks. I used these mini bamboo skewers and mini rubber bands. Take two wooden sticks and bind together by wrapping a rubber band around each end. To use, slide your wick through the middle of the sticks, and rest on the top of the container. Once your wax has cooled to 125 degrees, you are ready to pour it. Make sure you are pouring your candles in an area where the candles can be left alone to cool for 24 hours. You don't want to disturb your candles while they are fully curing. Pour into each container, leaving at least a few centimeters at the top. I've recently been experimenting with adding dried flowers to my candles. It makes them a little more special, and also adds to the fragrance when the candle is burning. 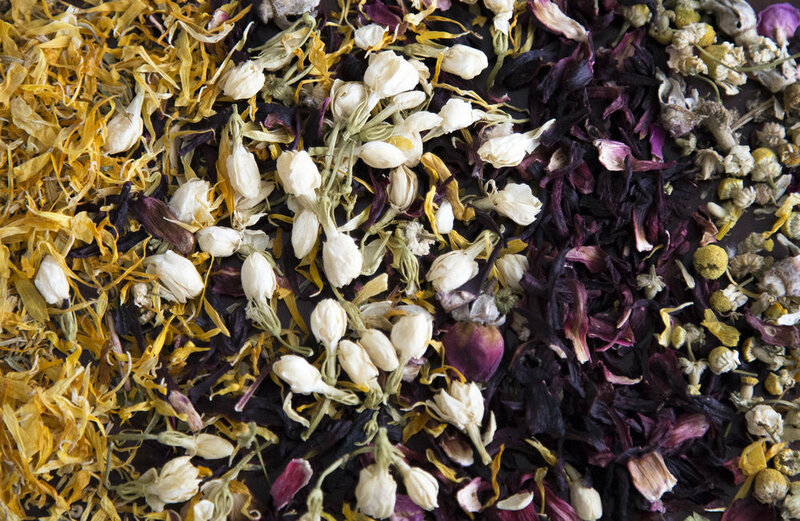 If you're using dried flowers, add them in immediately after pouring your cooled wax into the container. You can sprinkle dried flowers around the edges of your candle, but make sure to avoid any dried flowers touching or too close to the wick. (If the flowers are too close to the wick they could catch on fire.) By placing them around the edge of the container, the dried flowers will only come into contact with melted wax and won't be a fire hazard. Never leave a lit candle unattended. Use a stick to arrange your flowers. Allow the candles to cool undisturbed for at least 24 hours before moving them. After 24 hours has passed, trim the excess wick from the candle and it's ready to burn or gift! Mariella McNeany is an art director at James & Matthew. She joined the team in 2016 and lives in Chicago, Illinois with her husband and a grumpy chihuahua named Austin.